We donate 10% of our sales to ASPCA. This organization is very dear to one of the owners, Lori. She has a heart for animals, especially dogs. 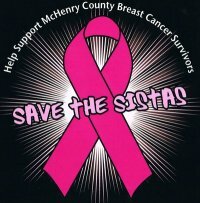 We participated in the "Save the Sistas" charity event in Johnsburg, Il in Aug 2010. We donated 5 gift baskets to this cause. This charity donates monies to Centegra Gavers Breast Center. We participated in the charity event for Conscious Christmas in Schaumburg, IL in Dec 2009. We donated a decorated chrismas tree, along with monies from attendees to an ASPA local shelter, Pets In Need Midwest in Ringwood, IL. This event was sponsored by Body Mind Spirit Expo.